add 1/4 cup of sugar, mix together and let stew. Stir often. Let simmer for 10-15 minutes until sauce thickens and strawberries soften. Add the 2 tbsps of sugar to increase sweetness (optional). Remove from heat, let cool. 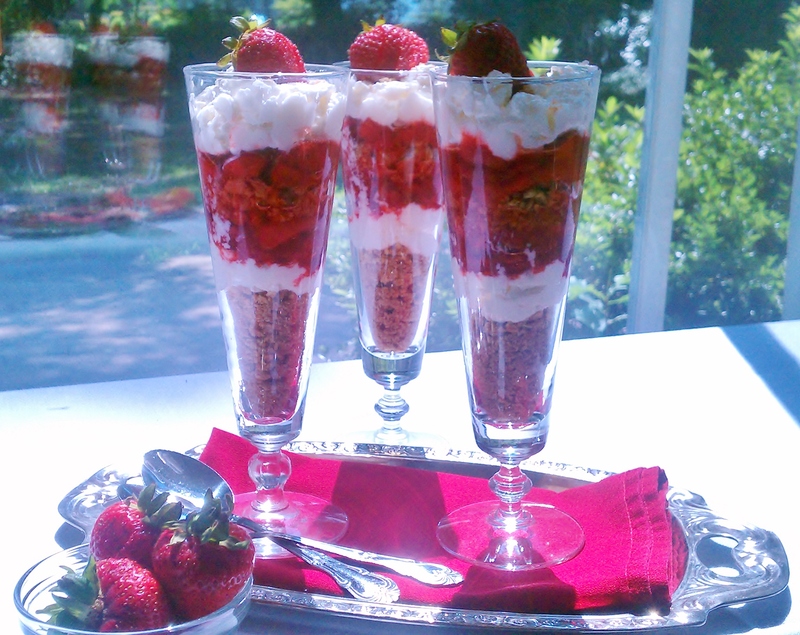 Place strawberries and sauce in container with lid or plastic wrap, refrigerate for approximately 30-60 minutes. Place heavy cream into a bowl. Add vanilla extract and powdered sugar. Use a hand held whisk or mixer to whisk cream until it form stiff peaks. If you desire a thicker, firmer whipped cream continue to whisk until it looks similar to icing. I use a food processors to crush the crackers. If you don’t own a food processor, another method that works place crackers into ziploc bag and roll over the bag with a rolling pin. Don’t crush the crackers to much, you need it to stay into crumbles for the consistency needed for this recipe. Place crushed crackers in a bowl, add brown sugar, and then stir together until well blended. Add melted butter and stir into graham cracker mix until well incorporated. Place mixture into bake safe dish (preferably glass) ungreased. Place into oven for only 10 minutes. Now onto the fun part. Building the dessert. This dessert right here…all I can say is…Destination Greatness! I have to tell you all the truth about this dessert. I dreamed about the ingredients a week before I attempted to make it. I honestly didn’t think it would come out well, but I gave it a try anyway. I am glad that I did. 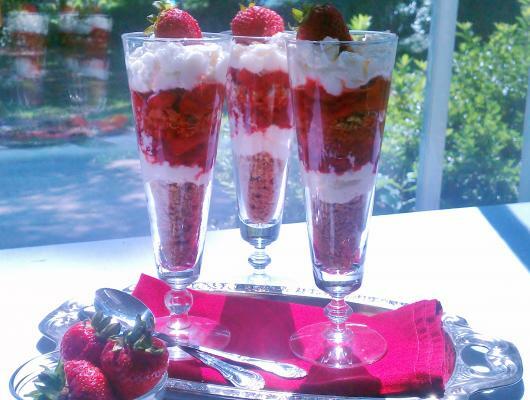 The best description I can give you about this dessert is…imagine a sinful version of a parfait. Relate this dessert to Lenny Kravitz’s “Fly Away“! The graham crackers is the guitar blaring in the intro, the whipped cream is the melody and strawberry sauce is Lenny singing “Yeah, Yeah, Yeah”.